Rescued Fox Thinks She’s a Dog. Meet Dawn. Dawn is one of the Nuneaton and Warwickshire Wildlife Sanctuary’s six resident foxes that cannot be returned to the wild. Most of the animals that find their way into the sanctuary are injured wildlife that are treated and then returned to their wild homes. But Dawn was a bit different. She was brought in as a young fox by a person who found her and thought she was a dog. You can hardly blame the person for thinking that, she certainly acts just like a domestic dog, rolling over for her belly to be scratched and licking Geoff’s (one of the sanctuary workers) face. Dawn was far too tame to be returned to the wild. She wouldn’t be able to fend for herself. Dawn is a cutie, and acts just like you’d want a pet to act, but it is important to remember that she was never meant to be anyone’s pet. Foxes are adorable, but they belong in the wild. 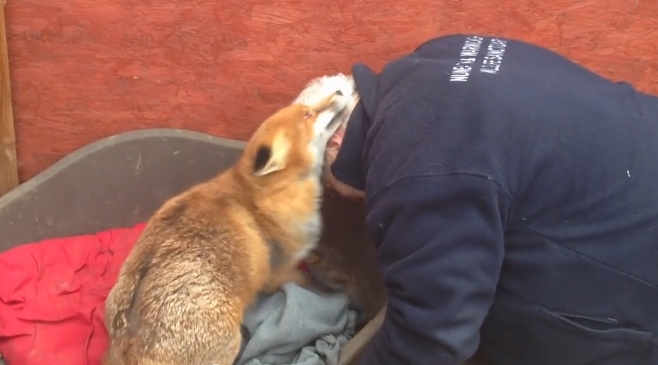 Responses to "The Love Between a Rescued Fox and Her Guardian Will Make Your Day"
So sweet... Animals are just amazing. Absolutely precious I love foxes, how could anyone want to hurt or kill them???? There is justice for animals on Earth.